We’re elated that the end result captures the innovation and cross disciplinary nature of the Lab’s work and we are confident it will become a signature touchstone of its influence and impact. 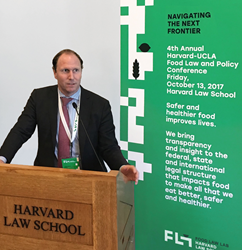 BrandCulture joined with hundreds of food entrepreneurs, government officials, policy makers, scholars, attorneys, industry experts and advocates at the 4th Annual Harvard-UCLA Food Law and Policy Conference held in Cambridge, MA on October 13th. The conference enjoyed record attendance and addressed a wide range of topics across emerging innovations in food production, health, environment, sustainability and animal welfare. With a research and policy agenda blending law with social science and the humanities, the conference speakers and participants more than lived up to the conference’s promised agenda to “Navigate the Next Frontier” in food law and policy. In addition to sponsoring the conference, the Food Law Lab seeks to air and ameliorate the most important existing and emerging issues surrounding the cultivation, distribution, preparation, and consumption of our most fundamental human need: food. Founded in 2006, BrandCulture helps build standout brands, inculcate strong cultures and help clients achieve long-term distinction and competitive advantage. With offices in Los Angeles, Atlanta, San Francisco and Barcelona, BrandCulture pioneered the concept of Shared Purpose, integrating branding and culture development to help organizations drive business performance. Strong Cultures = Great Brands. To learn more, visit brandculture.com.